Take care of your body - go for a run. Notice the world around - take time to appreciate wildlife in your area. Keep learning new things - learn a new language. Have goals to look forward to - make resolutions and stick to them. Find ways to bounce back - learn from defeats to do things better in the future. Take a positive approach - focus on the happy moments of your life rather than the sad. Be comfortable with who you are - do not dwell on your flaws. Be part of something bigger - join a society or club. The group Action for Happiness is led by Lord Layard, Professor of Economics at the LSE, and focusses on the importance of connecting with those around us, and feeling part of a community. It's backed by the Dalai Lama, Alain de Botton and numerous mental health charities. They are obviously taking this very seriously, as well they might given the disintegrating nature of society and feeling of 'last days of the Roman Empire' decadence. It was hard work finding a list of happiness in French. They seem to prefer moralising stories and long articles in the press. Ms de Milleville is not an eminent thinker as far as I can make out, but gives seminars on the secrets of numbers, dream interpretation and tarot. Still, her list, while predominantly navel-gazing, is not dissimilar to the other one although it misses out on the concept of giving which is a major source of happiness according to the eminent thinkers. My own experience of charitable work here has been that you organise an event to raise money for a worthy cause like the Ligue Contre le Cancer, and lay on a buffet and drinks. You invite professional types and those with money to spare. They arrive, fall on the buffet like they haven't eaten for a week, drink the stocks dry, ignore the charitable aspect of the evening and go home relieved and proud they haven't had to get their chequebook out. This happened on every occasion whatever the setting. I'm told it's typical of southern France (by the French). 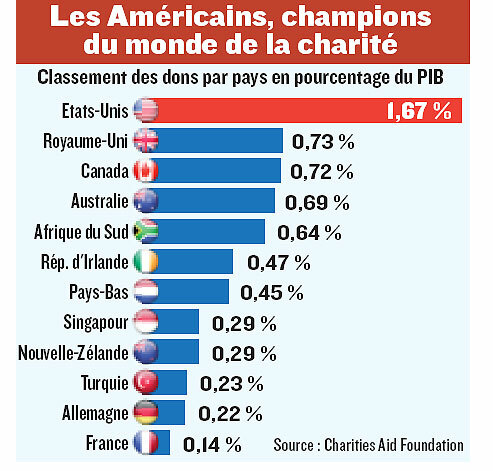 So, yes, I can understand why there is no 'giving' on the French list even though any money they donate can be used to lower their taxes. The other problem is that many associations indulge in 'charity business' where they are a charity in name only, which does tend to sour people to the idea of giving money. Obviously if you know that your hard-earned donation is going to 'Administrative Costs' this is hardly likely to increase your levels of happiness, likewise if you are trying to help but get told your help is taking paid jobs away from others you won't ask twice (which is what happened to a friend of mine). On the other hand, I read that there is a link between the level of social charges and the amount of money donated. The higher the level of social charges taken by the government, the lower the amount of money given to charity. The article also says that people are much keener to engage in voluntary work as proved by the levels of participation in the annual Telethon which raises money for neuromuscular conditions and other rare illnesses. It takes place in December when we're all supposed to be in a giving frame of mind although I'm usually struggling to pay transport costs to the UK, presents, and dealing with catch-up taxes. If you live in France, are you part of an association that raises money for a good cause? Are you aware of much activity outside the Telethon? I ask because I see very little advertising for charitable events and unless you are personally affected by something and are thus involved, it's easy to remain unaware of the level of voluntary work going on. Best stick to having fun, counting your blessings and spreading a little joy over a cool refreshing rosé while in France I reckon... As for being part of something bigger, the less I see of the inside of organisations and their committees the better. Cheers!